CHANDLER, Charles V. – One of the most conspicuous figures in the activities of this and the preceding generation in McDonough County is represented in the name which constitutes the caption of this biographical sketch. It is a familiar name in this section of the State of Illinois, and will pass into futurity in the annals of the city of Macomb, as that of her most cherished son. Charles V. Chandler was born in Macomb, McDonough County, Ill., January 25, 1843. His father, Col. Charles Chandler, who died December 26, 1878, was a prominent banker of Macomb and a sagacious financier. (A memoir of Colonel Chandler will be found in the preceding sketch.) The primary education of the subject of this sketch was received in his native city. Subsequently he attended school at Danbury, Conn., and still later became a pupil in the Lake Forest (Ill.) Academy. When he was on the point of entering Williams College in order to complete his education, he found himself no longer able to ignore his country's call for defenders, and in 1862 returned to Macomb and enlisted in Company I, Seventy-eighth Regiment Illinois Volunteer Infantry, in which he served as a private for nine months. He was then promoted to be Second Lieutenant. At the battle of Chickamauga, September 20,1863, he was severely wounded, a rifle ball passing through both thighs. A few months afterward another ball penetrated one of his thighs. He was the last member of his company who received a wound. He had just grasped a small hickory tree for support and had remarked to the First Liententant, "I guess we are through all right." when the ball struck him. Pressing his hand on the wound, he uttered the words, "I guess I've got another guess coming." Mr. Chandler afterward cut down the hickory free and now has a cane which was made from it. He returned to Macomb on a furlough and nursed his wounds until March 1, 1864, when he went back to the regiment and was pleased to learn that he had been promoted to the adjutancy, his commission dating from the day of his wound. Finding himself incapacitated for service, however, by reason of his injuries, he resigned his commission, returned home and became teller in the private banking house of his father which was afterwards changed to the First National Bank. In this capacity he served until his father's death, when he became President of the bank, and has continued thus since 1879. He was one of the incorporators of the first pottery works in Macomb. He is an extensive property owner in the city, being the builder and owner of the Opera House Block, which is known as Chandler's Block, the Chandler Hotel, the Post-office Building, and other business blocks, as well as residence and farm properties. For the past three years, he has been Treasurer of the Western Illinois Normal School, located at Macomb. He is the projector and promoter of the Macomb & Western Illinois Railroad, of which his son is Secretary and treasurer. On August 28, 1866, Mr. Chandler was married to Clara A. Baker, of Macomb, a daughter of the late Judge J. H. Baker, whose biographical record appears elsewhere in this volume. Six children have resulted from this union, namely: Charles J., who died in infancy; Clara, the wife of Frank H. Mapes, Assistant Cashier of the Bank; Mary; Ralph, Cashier of the Macomb Bank; George, Assistant Cashier of the Macomb Bank, who married Alice Chandler, a daughter of C. G. Chandler, and Isabella, who is a pupil in Wellesley College, Mass. In politics, Mr. Chandler is an earnest Republican. In 1887 be was appointed City Treasurer, and held that office several years. He was appointed by Gov. John R. Tanner a member of the Board of Directors of the Soldiers' and Sailors' Home, at Quincy, Ill., and by that body was elected its President. He was elected to the State Legislature in 1900, and served one term, being a member of the Committee on Banks and Banking, Ways and Means, and Appropriations. Fraternally, he is a Royal Arch Mason, belonging to Macomb Lodge, No. 17, Morse Chapter, No. 19, and Macomb Commandery, No. 61. He is also a member of the K. of P., I. O. O. F. No.145, and A. O. U. W., and of McDonough Lodge No.103, G. A. R., of which he was Commander many years. Among the beneficent deeds for which the subject of this sketch will long be remembered is his donation to Macomb of its beautiful City Park. But there is one act above all others which will stand as a source of perpetual honor to his name in the community on which his splendid gallantry on the field of battle shed unwonted luster. As a fitting and appropriate termination of this narrative it seems proper to recount the particulars of the event commemorating this act. With a lofty purpose Mr. Chandler laid aside the pension which the Government awarded him on account or wounds received in defense of the Union. The purpose thus nobly entertained was to erect a monument to the memory of the McDonough County soldiers who gave their lives for their country. That monument now stands as an enduring testimonial to the heroism of these worthy dead. A portraiture of the commemorating shaft, together with portraits of Lieutenant Charles V. Chandler, appears on other pages of this volume. The pension above mentioned represents an accumulation of fifteen years, with interest, together with an additional amount which had been saved from other sources of income for twenty years, in furtherance of this patriotic resolve. Until 1898 (at a meeting of the Grand Army Post) the intention of Mr. Chandler in this regard was never disclosed. The monument is from an original design by O. D. Doland, since deceased, who was the proprietor of the Macomb Marble Works. It rests on a foundation seventeen feet square, of the best limestone, with a base of seven feet square and a second base of five feet square, the shaft rising twenty-two feet above the level of the ground. 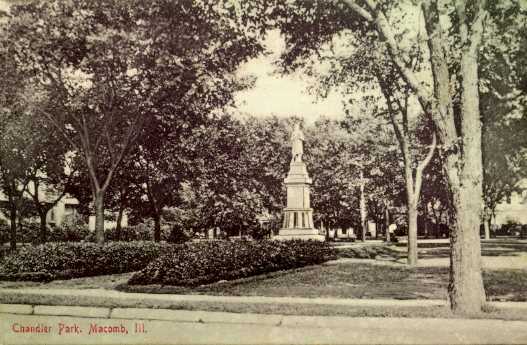 The memorial, which cost about $4,000, was dedicated August 3, 1899, with a parade composed of 274 veterans of the war, various military organizations and civic societies, bands of music, and a host of deeply interested citizens of Macomb. In fitting phrase, Lieutenant Charles V. Chandler presented the monument to the city of Macomb. After an invocation by Rev. Mr. Bratton, of Macomb, introductory remarks by Judge W. J. Franklin, Commander of the local Grand Army Post, and vocal and instrumental music by the Macomb Band and others, the shaft was unveiled by George Chandler Mapes, grandson of the donor. Maj. R. W. McClaughry then delivered the dedicatory address. Chairman Berry, of the Board of Supervisors, and Mayor Switzer, of Macomb, accepted the monument on behalf of the old soldiers and citizens of Macomb, and Comrade Wesley Clowes, of St. Mary's, Ill., read a poem in eulogy of the veterans. This was followed by appropriate music by the band, and the benediction was pronounced by Rev. J. H. Morgan. Thus transpired an event which constituted one of the most imposing and significant ceremonials ever witnessed in Macomb. On the day of the dedication Lieutenant Chandler was surprised by a gift from the old soldiers, consisting of a solid gold Grand Army Badge.